When Colson Whitehead was here in St. Louis in September for a reading, I was fortunate enough to get him to sign all 8 of his books. Pushing my luck on how much I could get him to sign, I also slid one more publication onto the table: Diaspora: the journal of black thought & culture from fall/winter 1989-90. 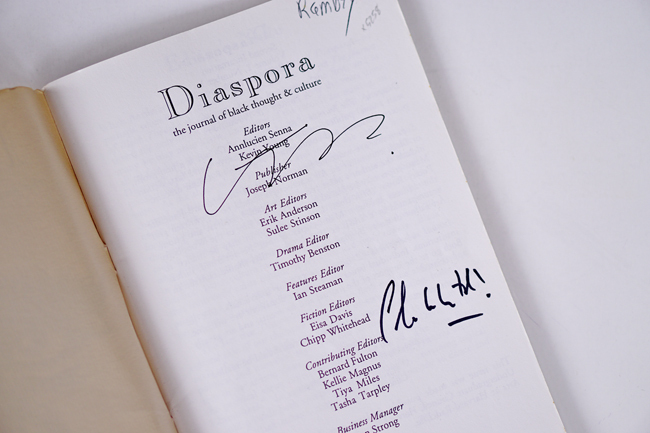 Diaspora was a Harvard student publication co-edited by Kevin Young and Annlucien Senna. A while back when I was building my collection of works by Young, I somehow came across that undergraduate publication. 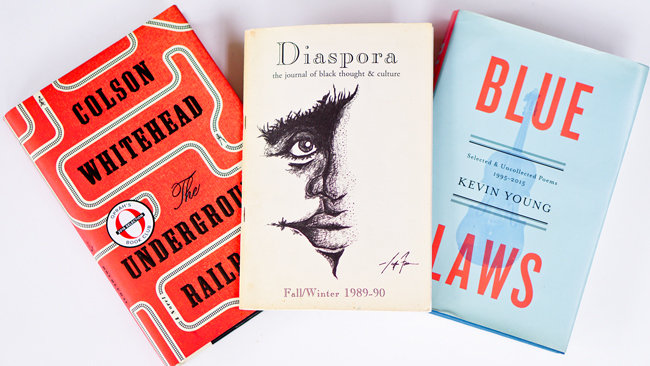 Diaspora includes various contributions, including works by Maya Brown, Tiya Miles, Tasha Tarpley, Farai Chideya, and Whitehead, who was then writing under the name "Chipp Whitehead." Kevin Young presents a suite of poems entitled "Visiting Home." 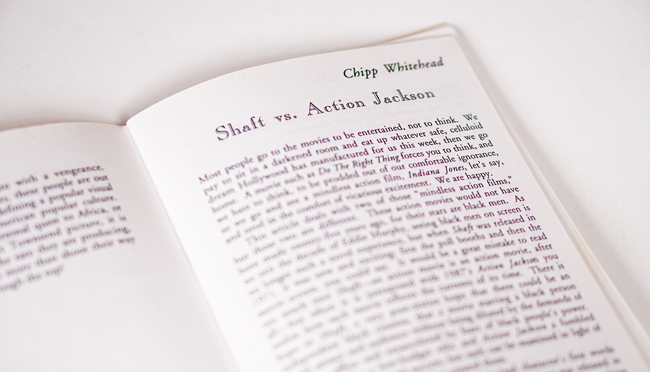 Whitehead offers two contributions to the issue: an essay about two action films starring black men, Shaft (1971) and Action Jackson (1987). He also contributed a short story entitled "Sylvia's Crime." In the contributors biographical sketches, we learned that Young "won the Academy of American Poets Prize in 1989 and has another long poem forthcoming in The Harvard Quarterly." We learn that Whitehead "is currently at work on an illustrated history of the Jheri Curl." Back in the summer of 2015 during a literature seminar in Lawrence, Kansas, Kevin Young was signing books after a presentation. I brought along nearly all of my books by him, and he signed them, including that issue of Diaspora. So I was pleased to get the chance to add Whitehead's signature to the same publication last month.